It is the latest celebrity health fix – vitamins injected directly into muscle tissue. Not so long ago the trendy way to deliver energy-boosting minerals was by intravenous drip. But it seems that, darling, is so last year, and fast-acting Vitamin B12 injections are now finding favour in luvvie land. Madonna, Rita Ora, Lily Allen, Meg Matthews and Dani Dyer are fans, while Tamzin Outhwaite and Denise van Outen praised the £30 jabs on social media last week. B12 helps with the functioning of the nervous system and the creation of red blood cells. The craze has been fuelled partly by the upsurge in veganism, which can often lead to B12 deficiency. The syringe injections promise to boost energy levels, help with weight loss and fight depression. Julie Miles, of Reviv Global which offers the jabs, said: ‘There is a huge market now. Some of our clients come in weekly for injections, some twice a week if they’re working towards a specific goal. But experts have expressed doubts. Nutritionist Carrie Ruxton said: ‘I don’t know why a healthy young person would need any Vitamin B12 injections, because all they need to do is go and have an egg sandwich, or a nice bit of roast lamb. While Reviv Global uses registered nurses to administer the procedure, the practice is said to be less regulated in other businesses. But the celebrities are enjoying themselves. 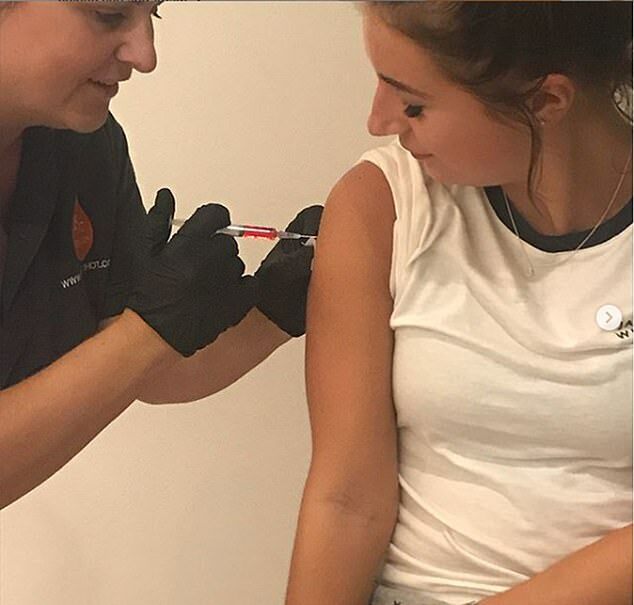 ‘For someone who used to have a needle phobia, that went pretty smoothly. Looking forward to feeling the benefits,’ said Outhwaite on Instagram.